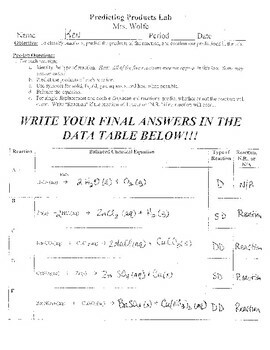 Have your students predict the products for 8 different reactions. Then, send them to the lab to perform these 8 reactions! There's nothing like predicting the outcome of an experiment and then confirming it! Your students will really see the value of their skills! 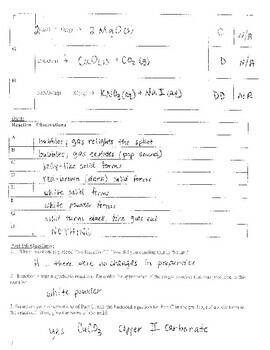 This product includes teacher instructions, lab procedures, a student handout, and an answer key. These are in WORD format, so they're easily edited. Chemicals and special equipment are needed for each lab group: 1 glass collection tube (my Glass-Bending Lab can teach students how to make these or you can substitute a stopper with a glass stint and rubber tubing), 3 mL FRESH 3% drugstore peroxide, a small scoop of manganese dioxide powder, 1 wooden splint, 3mL 6M hydrochloric acid, 2 small chunks of mossy zinc, 3 drops of 0.1M copper(II) chloride, 3 drops of 0.1M sodium carbonate, 10 mL 0.1M copper(II) sulfate, 5 mL 0.1M barium nitrate, ½ inch Magnesium ribbon, a small scoop of copper(II) carbonate, 5 mL 0.1M sodium nitrate, and 5 mL 0.1M potassium iodide.